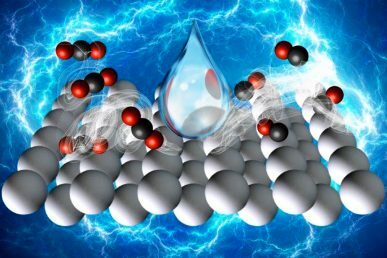 Researchers at the University of Illinois at Chicago and the Joint Center for Artificial Photosynthesis have determined how electrocatalysts can convert carbon dioxide to carbon monoxide using water and electricity. The discovery can lead to the development of efficient electrocatalysts for large scale production of synthesis gas — a mixture of carbon monoxide and hydrogen. “The electrochemical reduction of carbon dioxide to fuels is a subject of considerable interest because it offers a means for storing electricity from energy sources such as wind and solar radiation in the form of chemical bonds,” said Meenesh Singh, assistant professor of chemical engineering and lead author on the study published in the journal Proceedings of the National Academy of Sciences. During his postdoctoral research at the University of California, Berkeley, Singh studied artificial photosynthesis and was part of a team that developed artificial leaves that, when exposed to direct sunlight, were capable of converting carbon dioxide to fuels. In his latest research, Singh developed a state-of-the-art multiscale model that unites a quantum-chemical analysis of reaction pathway; a microkinetic model of the reaction dynamics; and a continuum model for transport of species in the electrolyte to learn precisely how carbon dioxide can be electrochemically reduced through a catalyst, in this case silver, and made into carbon monoxide. While the most plausible reaction pathway is usually identified from quantum-chemical calculation of the lowest free-energy pathway, this approach can be misleading when coverages of adsorbed species differ significantly, Singh said. It is essential, therefore, to integrate the effects from electronic states of a catalyst at the atomic-level with the dynamics of species in the electrolyte at the continuum-level for accurate prediction of electrocatalytic reaction pathways. “This multiscale model is one of the biggest accomplishments in electrochemistry,” he said. To understand how electrocatalysts in fuel cells or electrochemical cells work, scientists need to first probe the electronic and quantum levels, which can be extremely challenging in the presence of an electric field, said Jason Goodpaster, assistant professor of chemistry at the University of Minnesota and one of the co-authors. It took Singh and Goodpaster more than one year to individually produce and benchmark the models and integrate them into a multiscale framework for full-scale simulation of the electrochemical reaction. This is the first time, Singh said, that scientists have predicted quantitatively from first principles, the current density of carbon monoxide and hydrogen as a function of applied potential and pressure of carbon dioxide. “Once you recognize how these reactions are occurring on electrocatalysts, you can control the catalysts structure and operating conditions to produce carbon monoxide efficiently,” Singh said. Since they are product gases — carbon monoxide and hydrogen are insoluble in aqueous electrolytes — they can be readily separated as synthesis gas and converted into fuels such as methanol, dimethyl ether, or a mixture of hydrocarbons. Electrocatalysts such as gold, silver, zinc, palladium and gallium are known to yield mixtures of carbon dioxide and hydrogen at various ratios depending on the applied voltage, Singh said. Gold and silver exhibit the highest activity towards carbon dioxide reduction, and since silver is more abundant and less expensive than gold, “silver is the more promising electrocatalyst for large-scale production of carbon monoxide,” he said. Along with Goodpaster, co-authors include Adam Weber, Lawrence Berkeley National Laboratory, Berkeley, Calif.; and Martin Head-Gordon and Alexis Bell, University of California, Berkeley. This work was performed at UIC’s Materials and Systems Engineering Laboratory and the Joint Center for Artificial Photosynthesis, a Department of Energy (DOE) Energy Innovation Hub, supported through the Office of Science of the U.S. Department of Energy under Award DE-SC0004993. UIC also provided financial support.